Did you have a good Snow Day everyone? If you are situated in Europe you will probably have been lucky and a little snow came your way. BUT today we are not staying in Europe and I am not sure if this country even gets snow. We are traveling to Egpyt … YES they celebrate Christmas in Egypt! 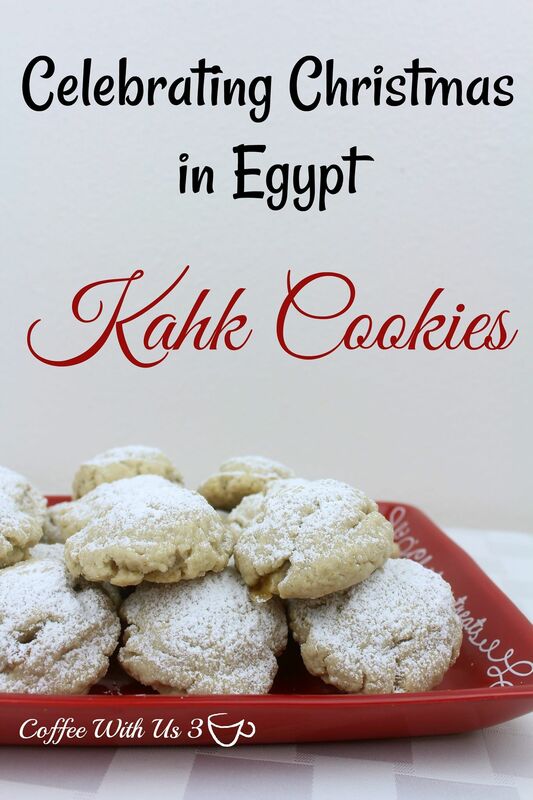 We will learn about how Christmas is celebrated there and as a Bonus Kerry also brought us some Kahk Cookies. I am certainly excited to learn more about this. Are you? Coffee With Us 3 is made up of Kerry, Lucy and Jamie. We decided to start this blog to share ideas, recipes, crafts, and more to encourage each other and all who stop by to read our posts. Let us help you make your house a home for you and your family through recipes, crafts, home & garden ideas, activities for kids, and stories of our lives and faith. What makes Christmas special to the three of you? Christmas is special to me because we are celebrating the birth of Jesus. Without Him, my life would be drastically different. His love has made the bad things easier and the good things great. I love celebrating His love for us. Christmas in Egypt, how do you like it? Is this something along the lines of your cup of tea?